A small New England liberal arts college that stresses work in the world as well. While you're here in North Bennington, drive or walk through the campus of Bennington College, the unique loosely-structured four-year college, which stresses artistic creation, acquaintance with nature, and work in the real world—all over the world. The location and situation of the college campus is particularly beautiful and is well adapted for the creative efforts of the students. But the beautiful campus is not the only place where students pursue a Bennington education. In each of undergraduates' four years at Bennington, they must pursue a 7-weekoff-camups winter Field Work Term in their chosen area of study. The students seek out real internships and jobs in the real world, anywhere in the world, and work to enhance their academic learning experience. 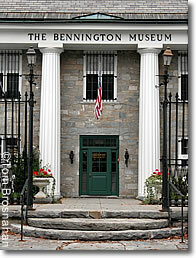 Founded in 1932 as a women's college, Bennington opened its doors to men as well in 1969. total enrollment of the college is about 738 students (620 undrgraduates, and 118 graduate students studying mostly for Master of Fine Arts degrees in Writing, Performing Arts, and Teaching English as a Second Language).